Many thanks to all concerned visitors who wondered about the re-direct to Valkee.com. I had prepared a stricter version with technical details, but I will leave it at that. I accidentally found a new unbelievable piece for the Valkee saga. I am checking this out at the moment and will not waste time. So stay tuned – this is also meant for the snail media writers who regularly visit me and my twitter account for lame articles of theirs. I am serious about this one. However, although Valkee Ltd did not seize earlightswindle.com, it still is squatting a large number of such domains, for instance earlightswindle.net and .info. Whois it? So that’s where the money goes. CU soon! Do 87% of Valkee users recommend the product to others? Why would 69% of users possibly recommend the scam device to others? The answer is utterly simple: The company chose the participants, which had to apply (!) for participation. What results could we expect? Strangely, with the launch of the Valkee-2 device, there appeared a 87% recommendation rate, allegedly from an user survey done in February 2013 by “Apex Healthcare Consulting”. Just for the case that anyone really thought that’s a reliable number. 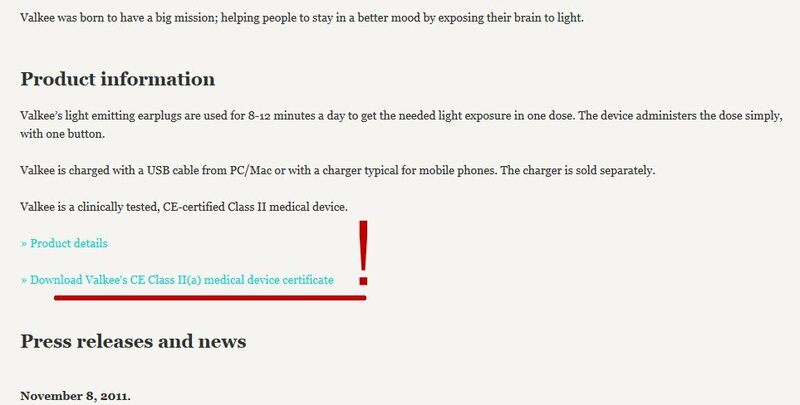 Does Valkee’s earlight work, because it is approved as a medical device? Valkee has been tested clinically for both treatment efficacy and user safety according to the requirements of the EU Medical Device Directive (93/42/EEC) and is consequently an approved European medical device in Class 2a for treating Seasonal Affective Disorder (SAD, Winter blues) and its many symptoms, and is CE-marked for that. Many other additional health benefits of bright light are being studied currently, by Valkee and by others, including health technology majors. All clinical studies of Valkee since mid-2012 have been double-blind, placebo controlled, even if not all have been published to protect new IPR, nor is there any requirement to publish all. The device is approved and must therefore be effective for Seasonal Affective Disorder. The rest is elusive, and there may be some results some day. We may not publish these. The company claims further to study the effects of bright light as a part of the health tech industry. Valkee knows very well, that earlight, or their euphemism “transcranial bright light”, has nothing to do with true bright light. Their last line of defense is in any case, that the scam device was officially approved. The linked file can be downloaded here. It says very clearly, that the product quality was tested. No word about any efficacy check. VTT Expert Services Ltd. (the only notified body in Finland), which ok-ed the device for approval, never had the competence to check for efficacy. The document disappeared from Valkee’s website the very same week. Conclusion: No independent 3rd party confirmed the efficacy of the earlight device. Is Valkee’s earlight a finnish invention? or: How to con a president, part 1. None of their 13 claims or “inventions” was patentable. 12 were already invented by other people and patented before. One claim was unclear and could not be checked. One was not patentable even if it had been new: diagnostic and therapeutic procedures in humans cannot be patented in Finland. A 4-year legal battle ensued then, resulting in a quite strange variant: Patented were LEDs in earphones, in case they were connected to a cable, that was linking to a controller, which must be operated by a user using software. In other words: Earlight treatment is not a finnish invention, and especially it is not Valkee’s. Extraocular bright light is not. The ear canaI as a route was known before. And light-emitting ear plugs were not new. The idea of influencing one’s emotions with earlight was also preexisting. What did Nissilä and Aunio invent to justify an INNOSUOMI award?